Earlier in the week Compile Heart sent live a countdown website. Today it held a conference where it announced it was working on not one, not two... not even three new games. No, Compile Heart is working on no fewer than five new JRPGs, and that's something to get excited about. One of those games is Death end re;Quest, and we got some in-game footage of that one in action today. The other titles are all too early into development to actually talk about, but we're told that one has a desert-theme. 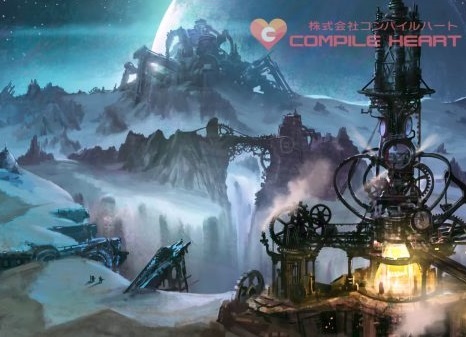 We only have a bit of concept art from that one - see above, but it looks like there's a steampunk theme running through the architecture, and we're certainly looking forward to seeing more (also given this is Compile Heart, a desert theme game will almost certainly mean harem costumes and that's a good thing). A second JRPG in development has a new creative team behind it, so it should be interesting to see how that one fits in the broader Compile Heart library. Compile Heart has traditionally been known for pushing out a lot of games, but over the last year the rate of releases has eased significantly. It looks like it will be a very busy 2018 and 2019 for the company indeed.